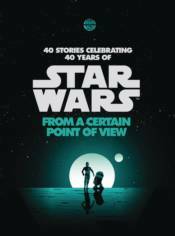 In honor of the 40th anniversary of Star Wars: A New Hope, this unique collection features Star Wars stories by bestselling authors, trendsetting artists, and treasured voices from Star Wars' literary history. Over 40 authors will lend their unique vision to 40 'scenes,' each retelling a different moment from the original Star Wars film, but from the perspective of background characters. Whether it's the X-wing pilots who helped Luke destroy the Death Star or the stormtroopers who never did find the droids they were looking for, readers will experience the familiar story in a completely new way.